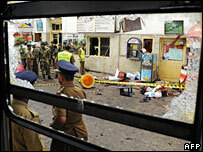 Rights group Amnesty International says threats to journalists have increased dramatically in Sri Lanka. The human rights group says threats to freedom of expression have gone up as the country slides back into civil war. It says that in the last two years at least 10 media workers have been killed. Others have been abducted, detained, or have disappeared. Most of those targeted have been Tamil journalists working in conflict areas in the north and east of the country. In the south, Sinhalese journalists have faced intimidation - especially those reporting on corruption, Amnesty says. Amnesty International says there is a climate of impunity where those responsible are not punished. The group says Tamil journalists working in the conflict areas in the north and east are under severe threat from the security forces and armed Tamil groups who appear to be acting with their consent. It says the Tamil Tigers have completely stifled dissent in areas they control. Amnesty has called on Sri Lanka's government to respect its obligations under international law, and on both the government and the rebels to end attacks on journalists.